Those with more 'refined' tastes should look away now - Siroccan diners don't put much time in for fancy food. Siroccan fare is a lot simpler than other places around the world. Ask for a seafood dinner, or an exotic Asian dish, and you'll likely be met with blank looks, or perhaps even laughter if the request is particularly unusual. Perhaps it is testament to the more down-to-earth nature of Sirocco that we go for portion size and taste rather than appearance. With this in mind, don't be surprised if you take a seat at one of Sirocco's many cafés or restaurants and are presented with a menu selection reminiscent of one you would find in London, Rome, or New York. Dishes such as 'meat and three veg', hamburgers, chili con carne, and spaghetti bolognaise are common throughout Sirocco. Particular local delicacies include éclairs, canneloni, and the national snack, chips and gravy. And when it comes time to wash it down, common choices are soft drinks, tea, hot chocolate, or in some cases, wine (or grape juice for non-drinkers). It's important to point out, however, that alcohol is not part of Siroccan culture - by and large, it is consumed infrequently in only moderate amounts. Those looking for a 'good time' with plenty of alcohol involved will have to look elsewhere. The same goes for coffee drinkers - it's available, but those of you that like cappuccinos and flat whites will more than likely have to settle for simple instant coffee instead. So, you're ready to take on Siroccan dining? Good! Let's get you started. For breakfast it's common to start with toast or cereal, with larger breakfasts such as omelettes, pancakes, or bacon, eggs, and hash browns (remember the hash browns unless you want to start riots) more common on weekends or special occasions. But Boxing Day has the best breakfast of all: pavlova. It's the only time it's okay to have dessert for breakfast. 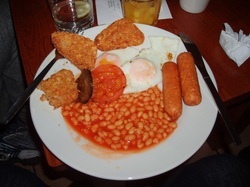 Lunches often involve sandwiches, soups (on wet days), or sometimes chips and gravy or saveloys (small red sausages also known as cheerios or cocktail sausages). It's not uncommon for some to skip lunch altogether and focus on morning or afternoon teas instead. Tea (what we call dinner) is treated as perhaps the most important meal of the day. Expect the widest range of food on offer - tacos, 'spaghetti Italiani', 'upside-down' (savoury mince on mashed potatoes), steaks, burgers... the list goes on. But when it comes down to it, Italian food is the most popular, with canneloni perhaps the most revered of them all. With such an emphasis on dinners, it only makes sense that desserts should be just as grand. Chocolate self-saucing pudding is a particular favourite, as are eclairs, cakes, and biscuits. 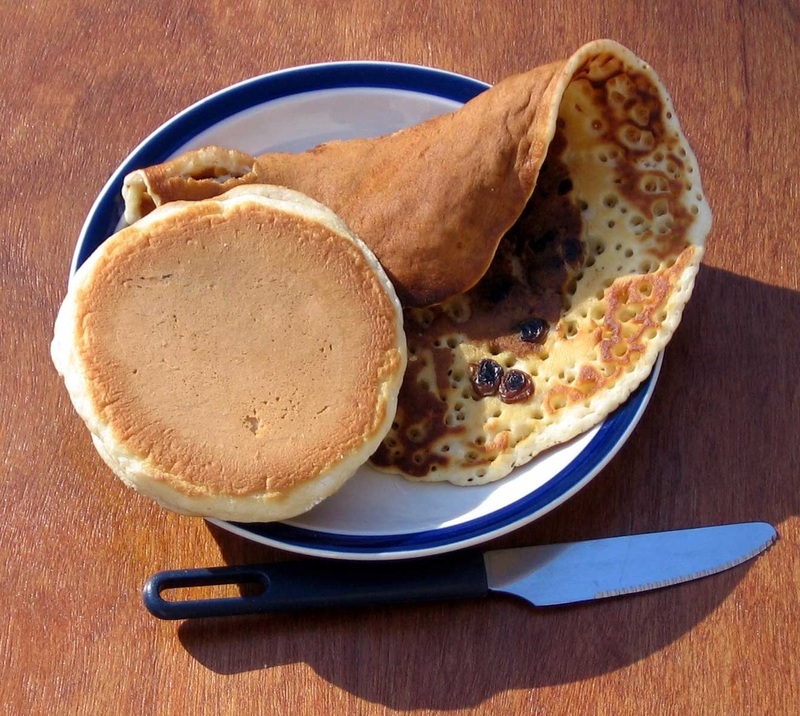 While the pikelets (served with butter, jam, and cream) are nice, be careful - they tend to be produced in high quantities. The record stands at between 80 and 100. And remember the tea! Siroccans are huge tea-drinkers, and it's not uncommon for the kettle to be boiling nearly all day and night. It might sound odd, but there's nothing unusual about seeing someone drinking a hot cup of tea in the heat of a Cambrian January, either. Hot chocolates are also very common, but tea always comes first. Just remember that tea refers to both the drink and dinner in Sirocco, so be careful what you ask for. A full 'Siroccan breakfast' can include baked beans or spaghetti, sausages, tomatoes, and fried potatoes, but the bacon, eggs, and hash browns are standard. It might not be haute cuisine to some, but to the Siroccan palate, chips and gravy is pretty good. Pikelets (at left) are common and widely eaten in Sirocco, except with the Premier, who has seen (and eaten) hundreds of the things.